I sat down hesitantly at the piano bench on the church stage. Gerald the ‘Music Minister’ had been playing a soulful gospel interlude – the kind you hear behind heartfelt words of pastoral praise on Sunday morning. What can I play that could even possibly match that deep level of feeling and expression, I asked myself. Blessed is the merciful One, ruler of the world, creator of this bread. It occurred to me that I should play this simple melody on the church piano, in the Key of C. I chose the key for its familiarity: most of the notes are white except the ‘blue’ notes: those played slightly out-of-tune for expressive effect. For a pianist, choosing a key is like choosing a bed: you can feel the contours of the song along the board’s slender keys even before you rest your hands on them. The Key of C is my Sleep Number. I started with the simple melody, slowly and tentatively on the higher register. Eyes wide open, heart pumping. To be witty, I added the major third an octave below. How clever am I! The church auditorium felt empty, and Gerald stood looming over me. I better add some bass to this, I felt. Left hand pinky and thumb stretch out into octaves and pound out a counter-line below. Now the middle is missing. Add in some soulful chords around middle C, tightly-packed with 2nds and major 7ths that shake each other like rippling pond waves. Now I can hear the sound filling the room, like a cocoon of safety. I’m almost comfortable. Stop. It doesn’t feel right, I tell myself. Something’s off. Mid-note I pause. “You’re only hitting the white keys!” he responds. He sits down, laying his hand on his musical bed. His bed is the Key of Db – all the black keys. He starts to play something flowing and erratic. It vaguely resembles the song I was playing, if you took my song and threaded it through a spaghetti-maker, then looped it around a thousand gold rings in every direction up and down. Like a musical rube goldberg machine. I’m reminded why I love jazz and gospel music: the spontaneity, the complexity, the collaborative spirit between musicians. No rules, just love and feeling. And the demand for pure authenticity without pretension or pretending. I am feeling convinced that music could help heal us. From the politics of today. The racism. The fear. The shame. The “other”-ness of the uncertain. Our buddy Andre whips us out of the musical frenzy with a joke. Gerald looks at me and smiles. My discomfort fades away and we laugh about the black and white keys: it really takes both of them to make the music just right. 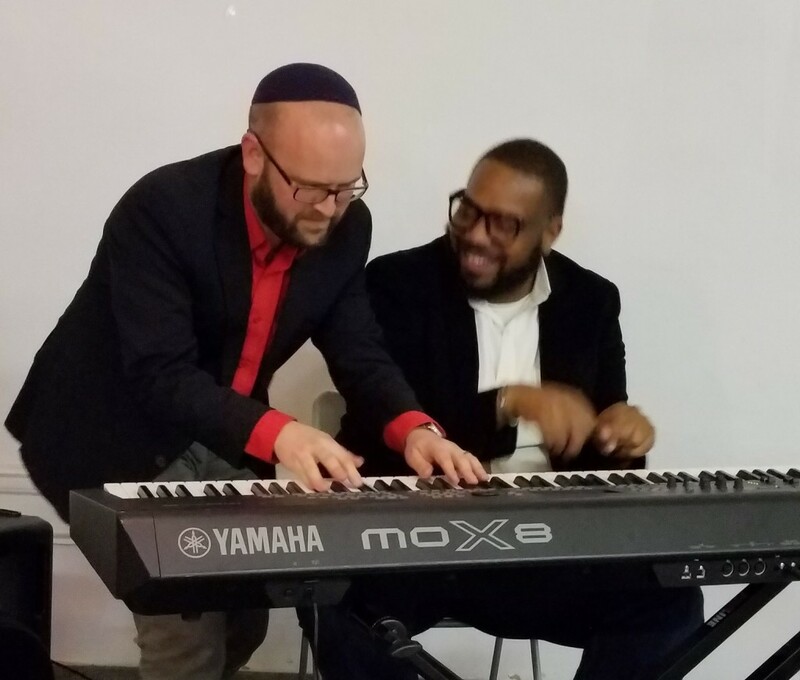 Gerald and I are both part of the Bethel Community Transformation Center, an interfaith space in the historic Temple Beth El former synagogue in Detroit that is raising money to build healing and reconciliation dialogue between Jews and Gentiles, blacks and whites, young and old in Detroit. To support our work in the final stretch of our Kickstarter campaign, visit BCTCDetroit.org.